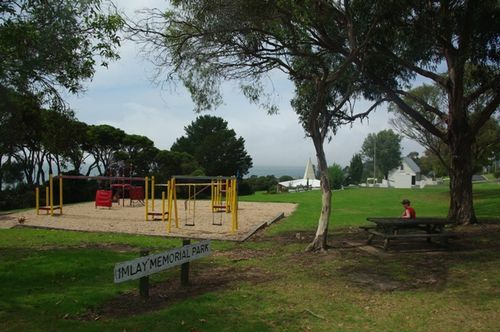 Imlay Memorial Park commemorates the Imlay brothers who were major pioneers and landowners of the Eden District. The Imlay Brothers, Alexander (arrived in Sydney in December 1829), Peter (arrived in Hobart, February 1830) and George (arrived in Sydney as surgeon-superintendent of convicts on the Roslyn Castle in February 1833), were all trained as surgeons either in the army or navy. George and Alexander worked on the staff of the Sydney Infirmary. In 1832, Alexander Imlay toured the south coast with Governor Bourke and by 1833 had acquired 518ha on the Bredalbane plains. Peter Imlay in the same year called at Twofold Bay where he saw the possibility of starting another shore-based whaling station to complement his and his brothers’ pastoral interests. By 1834, the Imlay Brothers had established vast pastoral runs and were shipping live cattle and sheep and salted beef to Hobart from their port at Twofold Bay. Peter was joined by George in 1835 who, although he was totally involved in the pastoral/whaling activities at Twofold Bay, was retained as a naval surgeon until 1841. They erected Eden's first, albeit modest, building, a small slab and bark hut at Snug Cove. The 1840s were a time of economic depression and although the brothers held 3,885 sq. kilometres of land, their fortune dissipated so that by 1844 they only controlled four runs (still totalling 15,135 ha) in the Bega district. The Walker Brothers, merchants of Sydney, foreclosed on the Imlay Brothers and acquired most of their land.